Koror/Munich, February 02, 2016 – During the boot show in Duesseldorf/Germany, Sam’s Tours Palau and its sponsoring partners gave close to 600 prizes away to raise money for the educational program of Shark Angels. Visitors of the diving hall at this year’s boot show were excited about the opportunity to win great prizes at the booth of Sam’s Tours Palau. 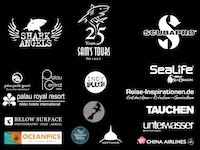 Celebrating 25 years of excellence, the dive center in cooperation with Shark Angels and sponsoring partners offered lottery tickets with the chance to win 600 prizes worth circa 25,000 Euros. Every fifth ticket with a lucky number meant a win and among the prizes were vouchers for hotel & dive packages in Palau, dive computers, regulators and masks from Scubapro, dive lights from Sealife, plush sharks from Indyplush, photos and artwork from renowned underwater photographers and artists, T-Shirts from Shark Angels, apparel from Neptunic, and travel guides and magazines from German media. At the end of the show, Sam’s Tours handed a check with 5,798.14 Euros over to Shark Angels. Text: Julie Andersen, founder of Shark Angels, is accepting the check from Marc Bauman, Vice President of Sam’s Tours Palau. Text: Numerous, attractive prizes have been given aways thanks to the support of the generous sponsors.